You have probably spent some time wondering just how fast those spikes that you have been studying are? 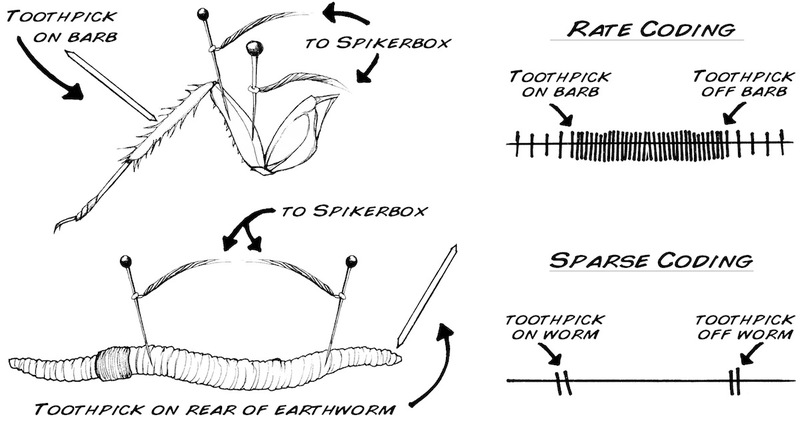 Now you can find out with our Neuron SpikerBox Pro and an earthworm! In this lab you will learn how to use the Neuron SpikerBox Pro by measuring the conduction velocity of a spike using an earthworm. You will also learn about "Sparse Coding," a different neural code than the "rate coding" we have been previously studying. Note: This experiment was peer-reviewed and published by the American Physiological Society in the journal "Advances in Physiology Education" - Read the paper intrepid scientists! for a more in-depth treatment of the experiment described below. Up to this point, we have been studying spikes emitted from crickets and cockroaches, mostly by monitoring the "spike rate" and "spike presence" in response to certain stimuli or conditions. We now will study "spike speed." 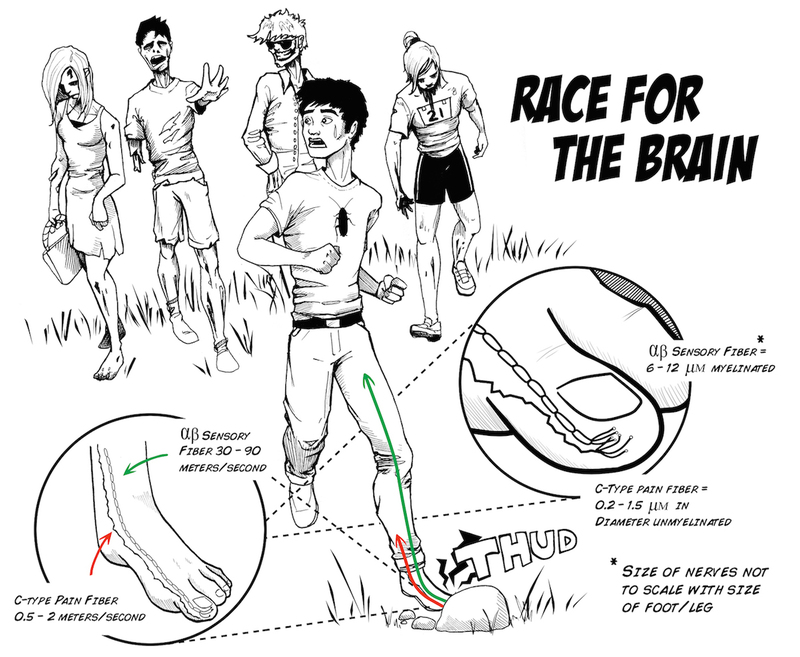 You probably think the nervous system is pretty fast. You seem to hear the spikes immediately when you touch the leg of the cockroach or blow on the cerci of the crickets. But is it instantaneous? Of course not! Not even light, the fastest signal in the universe, travels instantaneously. But how fast is a nervous system? Is it faster than a car, faster than a plane, or faster than a cell phone? And how can we measure it? 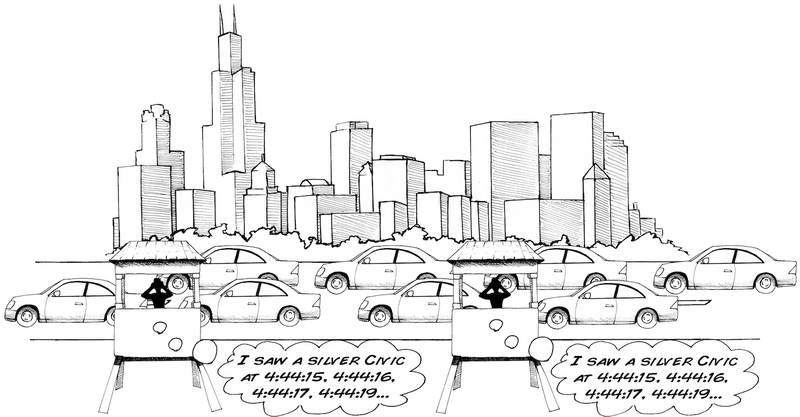 Similarly, with your SpikerBox, you can tell if you saw a spike, perhaps what kind of neuron generated that spike, and the spike time, but you can't tell how fast the spike was traveling down the nerve. 1 minute = 0.016 hours. Dividing 1/2 mile by 0.016 hours, you calculate a speed of 31.25 mph. Thus, we can measure the speed with two observers, and that's why we hereby announce the "Neuron SpikerBox Pro" to measure two points along a nerve as a spike travels down it. So, why don't we take our SpikerBox with our two electrodes and ground, put it in the cockroach, and measure the spike output of the two channels? You will notice immediately that there are a lot of spikes happening on both channels, in fact, way too many to keep track of it all. You can see the problem, There are a lot of spikes occurring in the cockroach leg, and identifying unique ones with two observers is very tricky. The femur of the cockroach leg has 2 nerves inside, and inside each nerve is about 100-200 neurons, all firing many spikes. We are also limited by how far we can place our electrodes from each other in the cockroach leg, as the leg is only about 8 mm long. We have been studying arthropods (insects), but we now move to a new class of invertebrate: annelids! Or more commonly, worms! 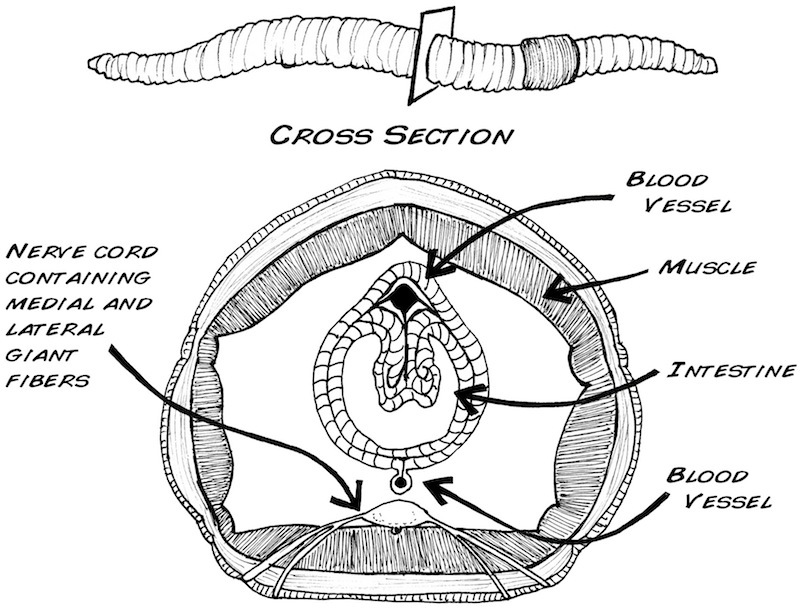 Enter our newest preparation: the common earthworm, Lumbricus terrestris. It's a simpler animal than what we've studied before, and the earthworm contains three large axons that run its length, the "medial giant" fiber and the two "lateral giant" fibers. The medial giant fiber transmits information about the front of the worm (the part closest to the clitellum), and the lateral giant fibers transmit information from the skin cells of the posterior end of the worm (Kladt et. al 2010). This sparse coding scheme is what we will see in the earthworm experiment below, and we will exploit it to measure the conduction velocity (or speed) or the spikes. Place a healthy earthworm in the alcohol mixture and wait three-four minutes. Do not wait too long; as with human anesthesia, the delicate balance between too little anesthesia and too much is tricky. 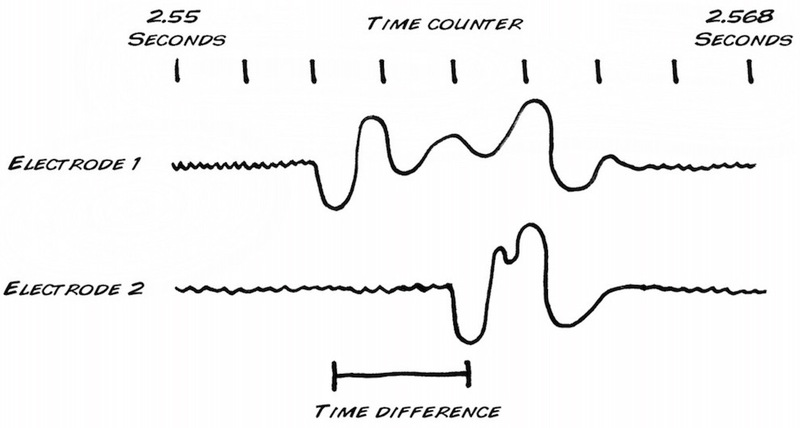 Too little anesthesia, the earthworm will move around during the experiment, and the resulting muscle electrical activity (electromyogram) will drown out the small neural electrical signals you are interested in. Too much anesthesia and the nerves will not fire. We've found 3-4 minutes is a good range. 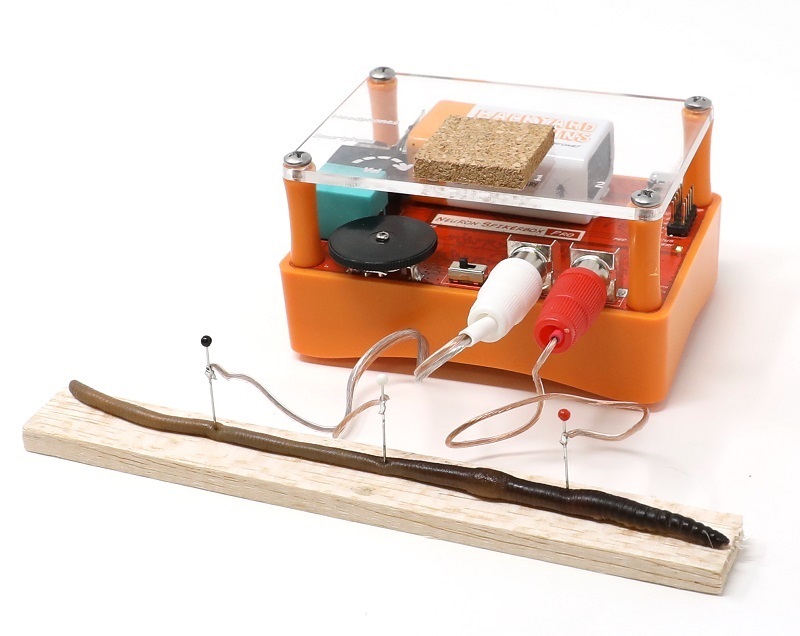 Place the Earthworm on a piece of balsa wood or thick cork, and put your three electrodes of your two-channel SpikerBox in the posterior end of the worm (see picture above). Plug the electrodes into your Neuron SpikerBox Pro and the USB cable into your PC. Open our SpikeRecorder software, and click on the USB symbol to pair with the Neuron SpikerBox Pro. Press the record button on your Spike Recorder software, and, using a plastic or glass probe, tap the posterior end of the worm. You should hear the evoked spikes caused by the tap. Interestingly, the neurons in the earthworm are myelinated (covered in insulating fat), and you will notice the spikes are much quieter than you are used to (Hartline & Coleman 2007). Many nerve diseases, such as Multiple sclerosis, are caused by a degeneration of this fatty covering. Make 3-4 taps, separated by about 3-4 seconds each. Measure the time delay between the two channels by clicking at the beginning of one spike, then dragging to the start of the next. In the corner of the screen, you should see the amount of time you have selected. Remove the electrodes from the worm, dip the worm briefly in water to remoisturize it, and return the worm to its styrofoam container. It can tolerate the needle placement and be used for another experiment another day, or you can return it to the environment where you found if you live in wet climates where Earthworms can be harvested in your backyard. Now start exploring. For example, does this measurement change from spike to spike? Does it change from earthworm to earthworm? Are smaller earthworms faster or slower than large earthworms? Is this speed sensitive to depth of anesthesia? These are all questions we would like to know, and you do too! Let us know what new discoveries you make. To help you learn how to identify Earthworm Spikes, here is an example Earthworm Recoding you can analyze.